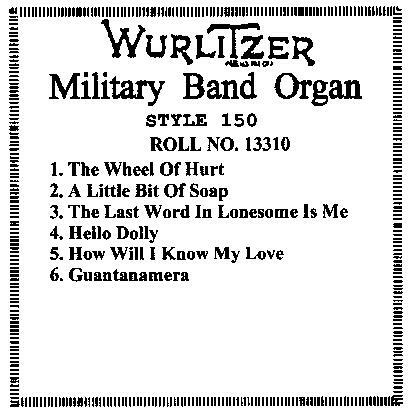 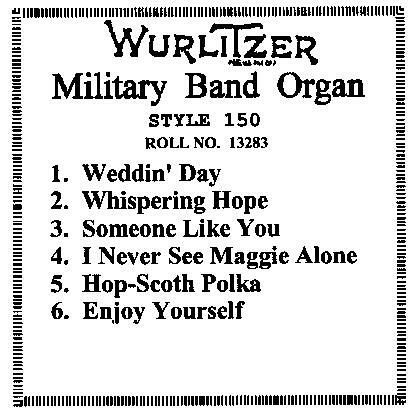 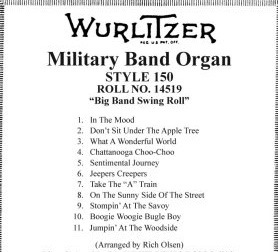 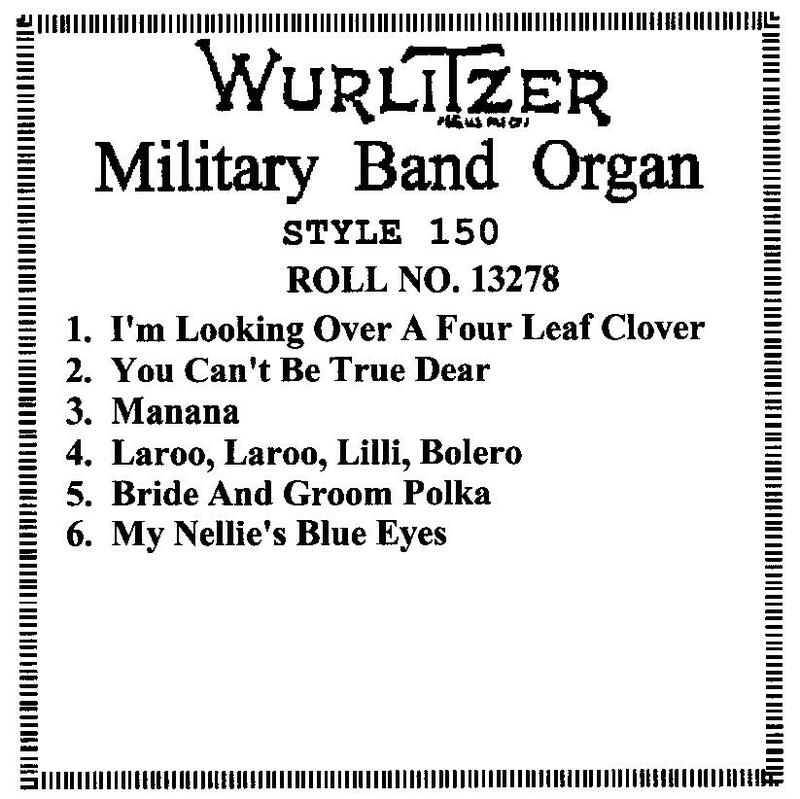 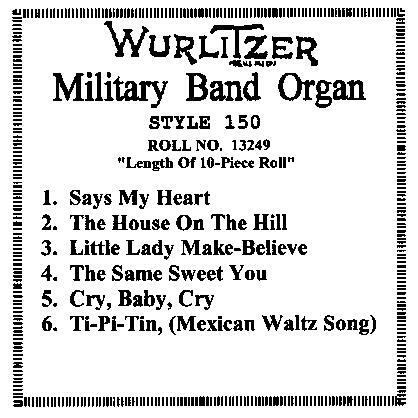 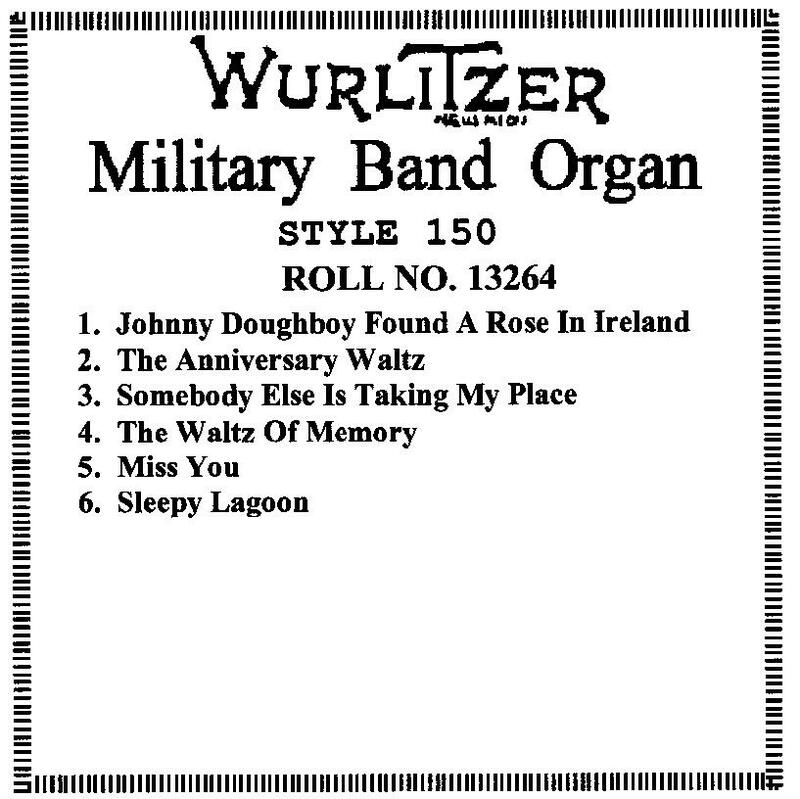 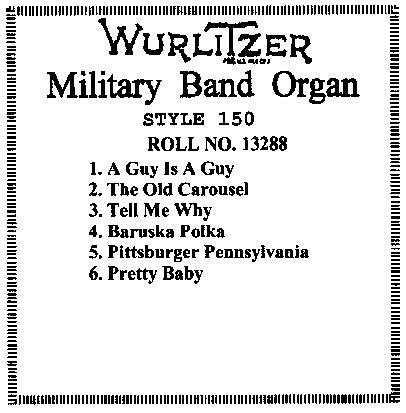 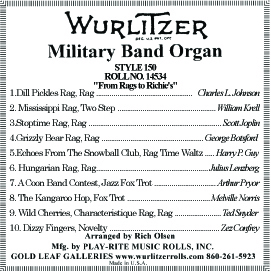 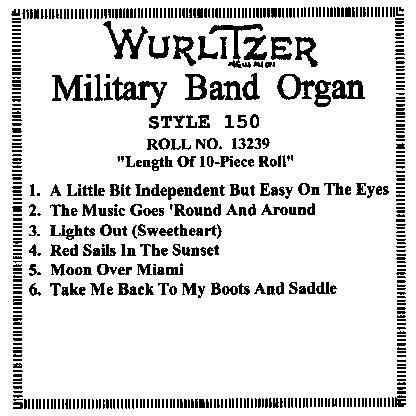 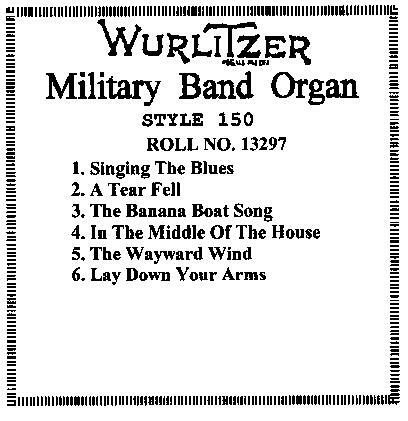 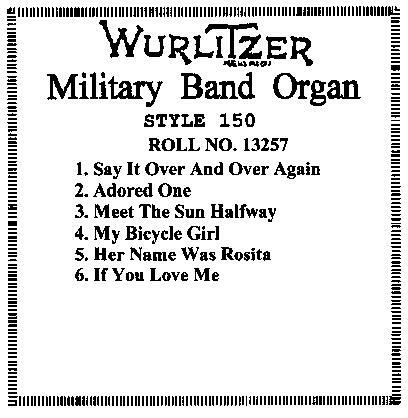 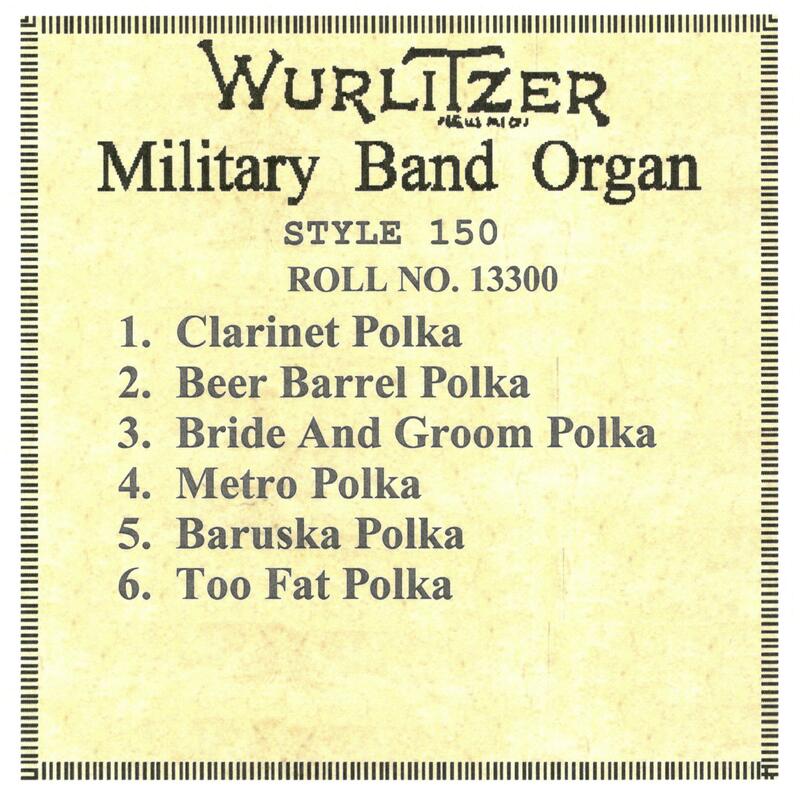 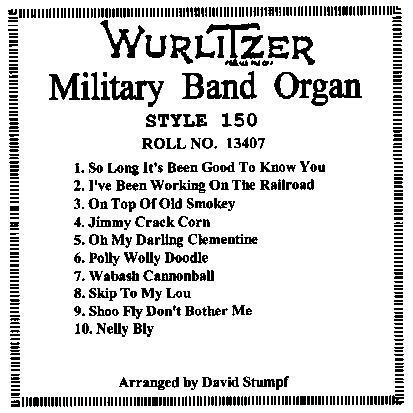 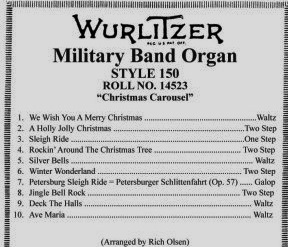 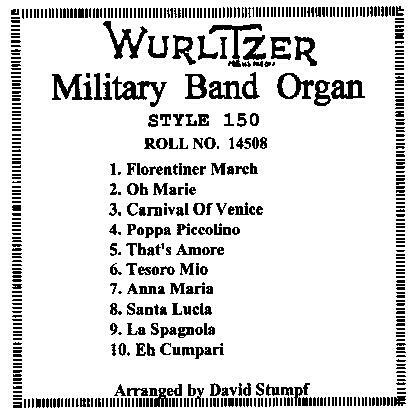 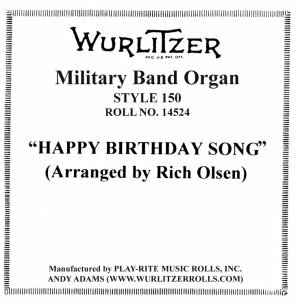 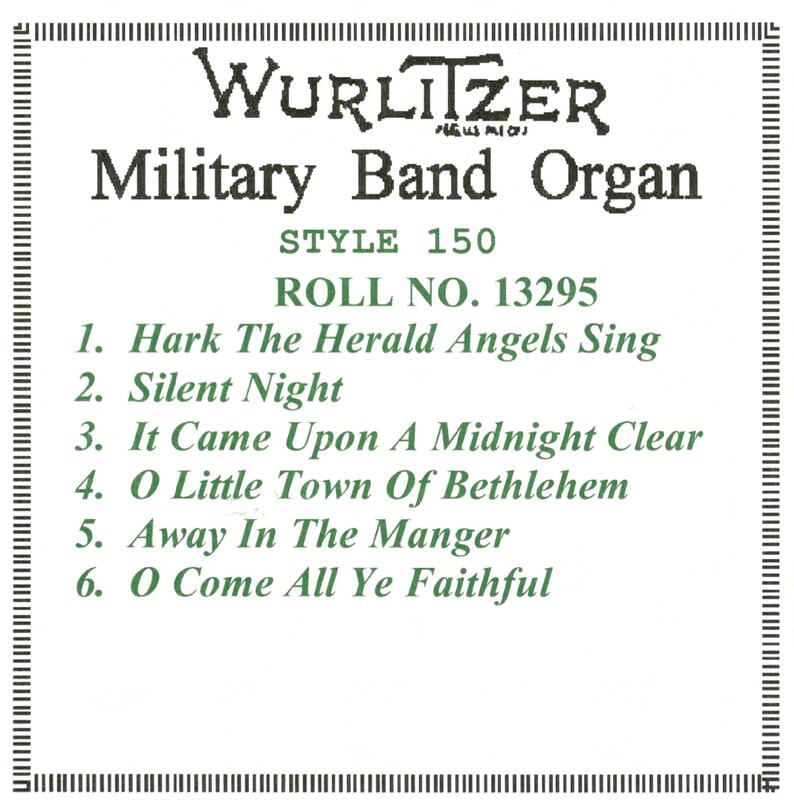 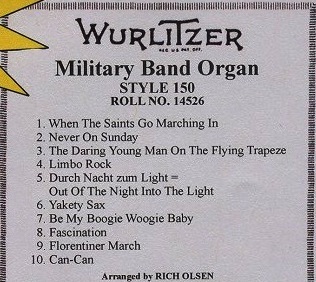 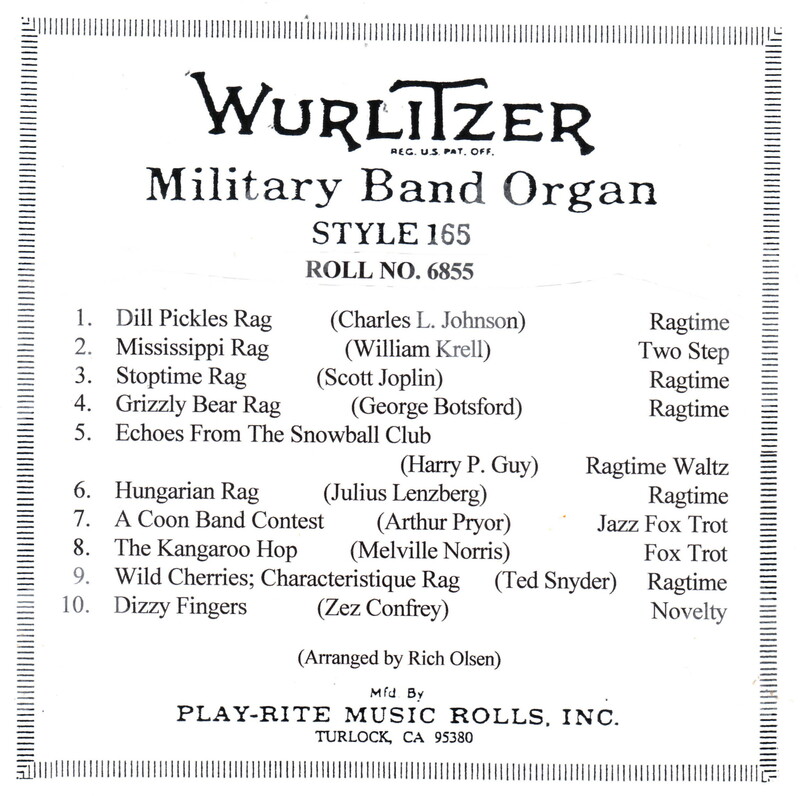 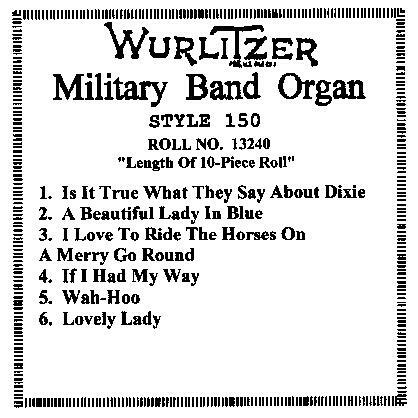 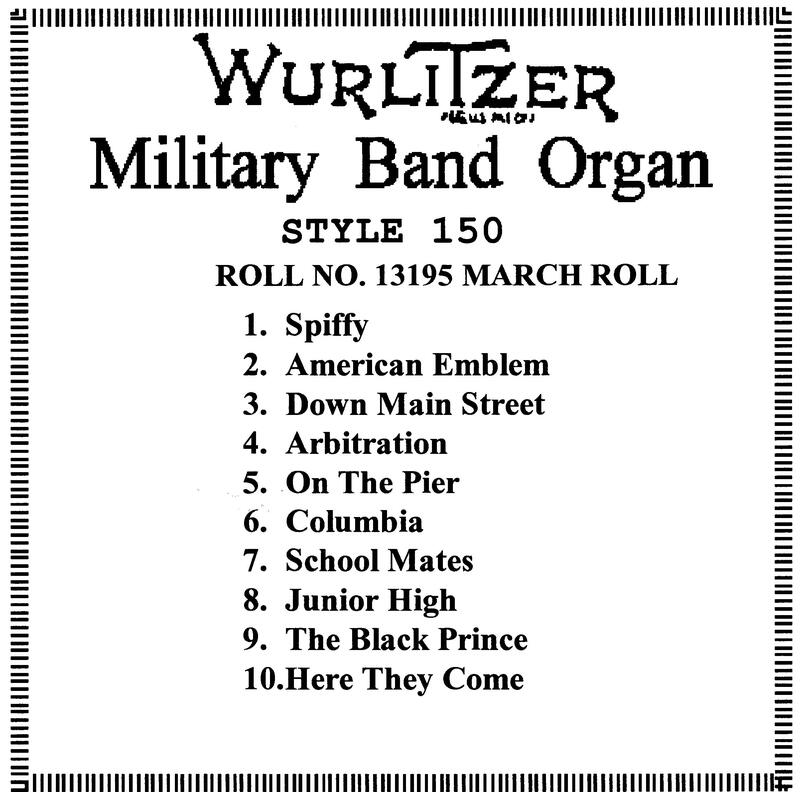 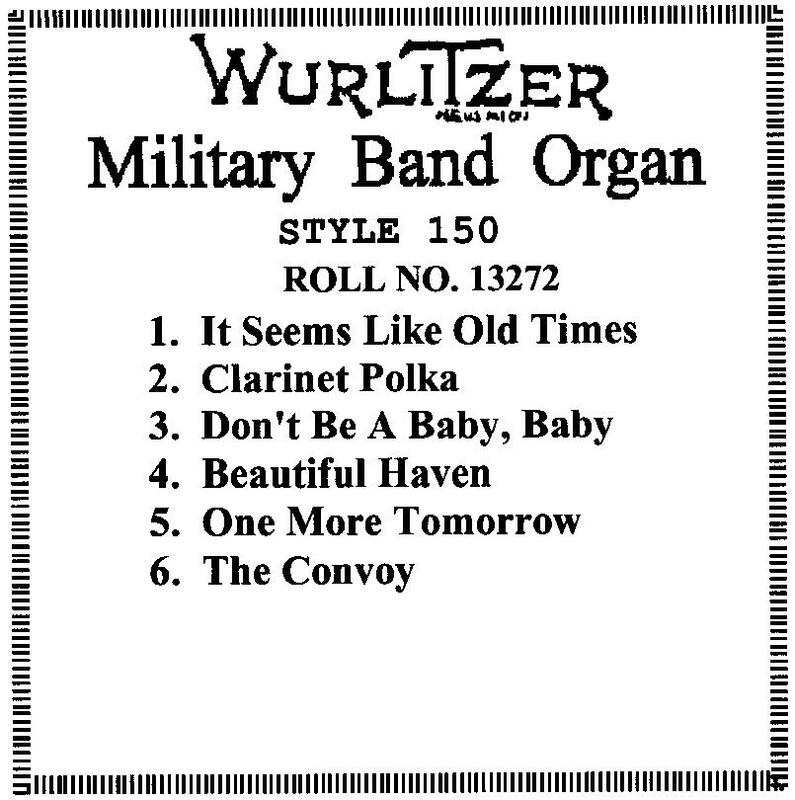 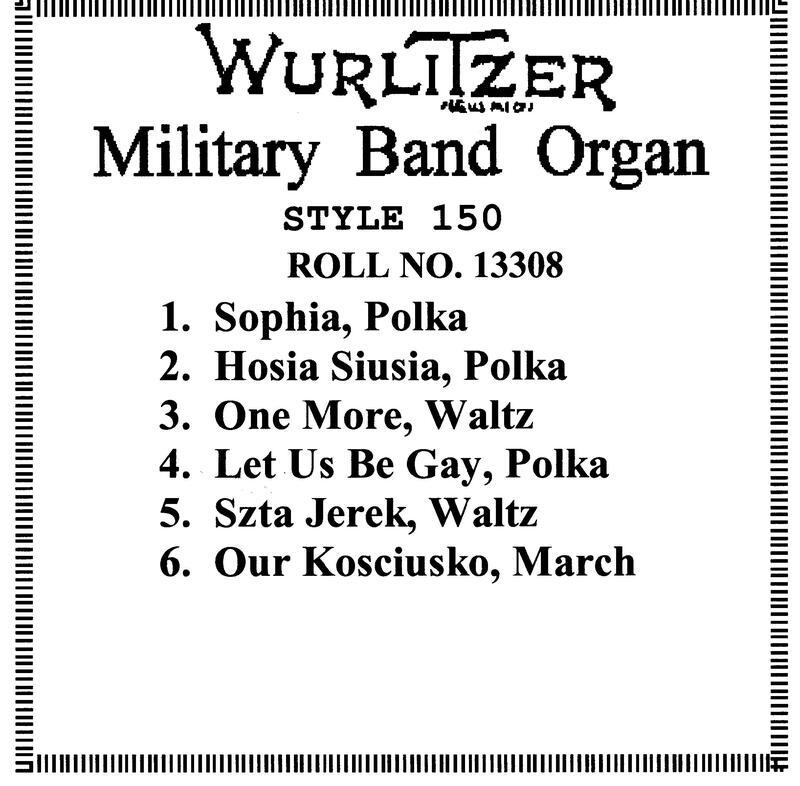 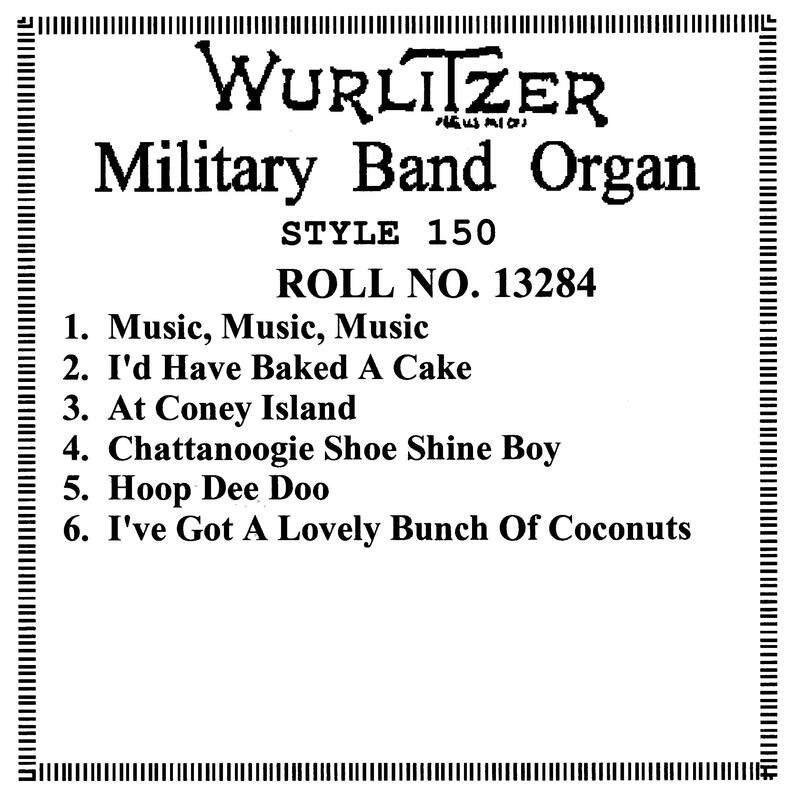 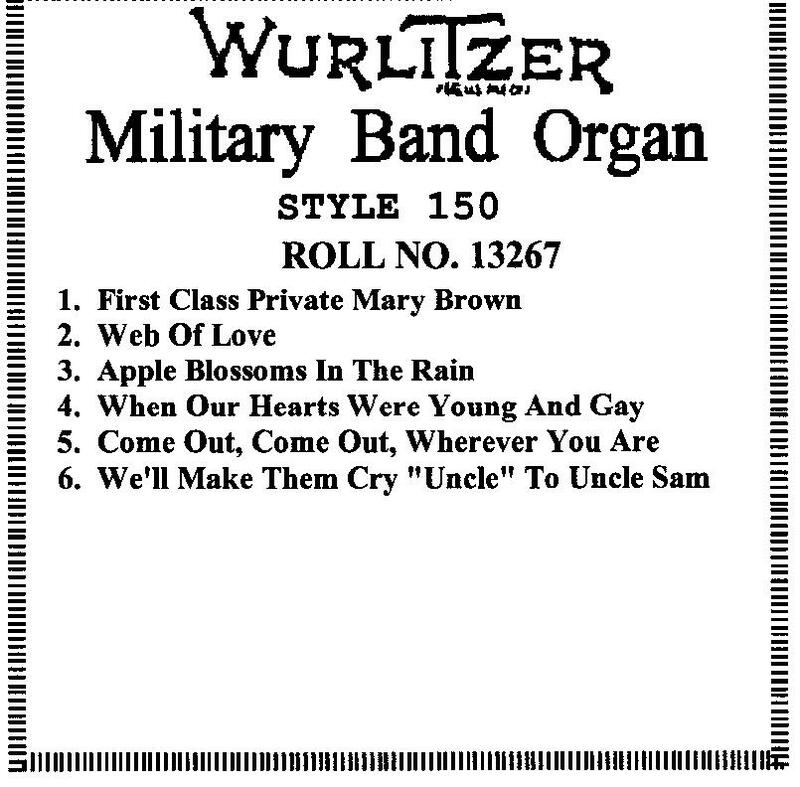 "OFFICIAL SONG OF THE UNITED STATES MARINE CORPS"
"6/8 MARCHES - FULL OF SNAP AND PEP"
"MARCH & WALTZ ROLL" "SUITABLE FOR SKATING" "LENGTH OF 10 PIECE ROLL"
WALTZ FROM "THE CHOCOLATE SOLDIER"
"MARCH & TWO STEP ROLL"
"MARCHES FULL OF SNAP AND PEP"
"MUSIC AS YOU LIKE IT"
"SPECIAL WALTZ REVIEW ROLL FOR SKATING"
"FOX TROT & WALTZ ROLL"
"FOX TROT & WALTZ ROLL "
"FOX TROT, WALTZ & TWO STEP"
"FOX TROT & WALTZ, ONE STEP"
"FOX TROT, WALTZ, ONE STEP & MARCH"
"FOX TROT, ONE STEP & WALTZ"
"WALTZ, ONE STEP & MARCH"
"TANGO,FOX TROT, ONE STEP, TWO STEP & MARCH"
"FOX TROT, WALTZ & MARCH"
"FOX TROT, ONE STEP, TWO STEP, WALTZ & MARCH"
SHALL WE GATHER AT TEH RIVER? 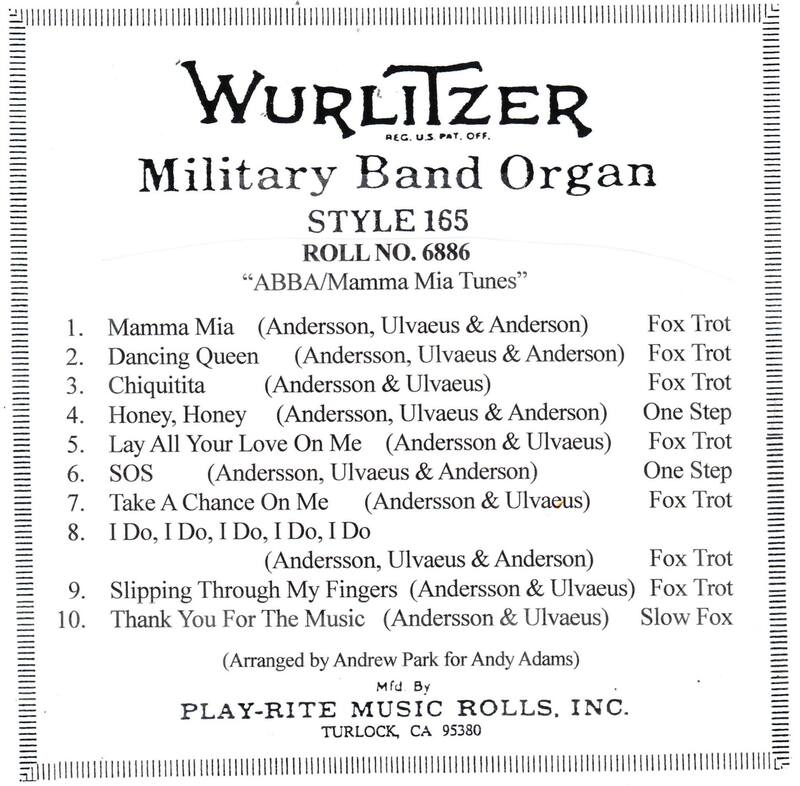 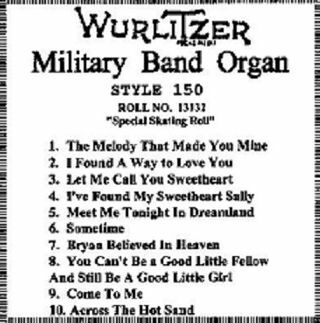 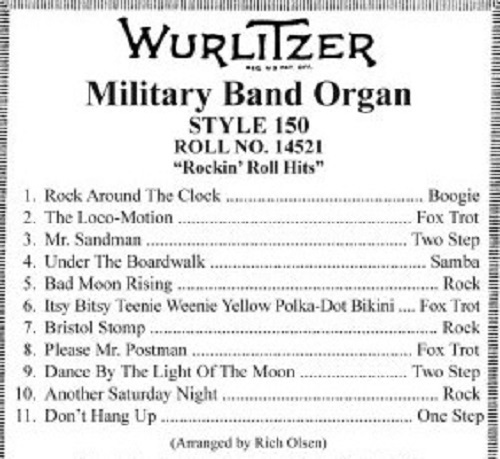 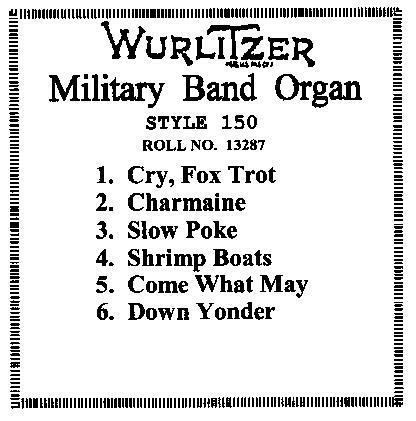 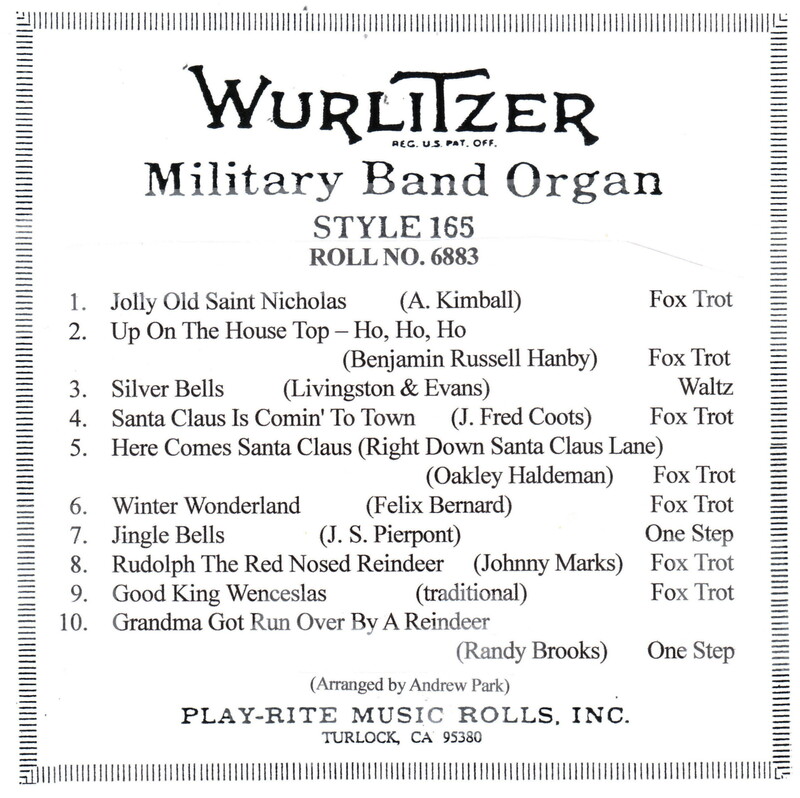 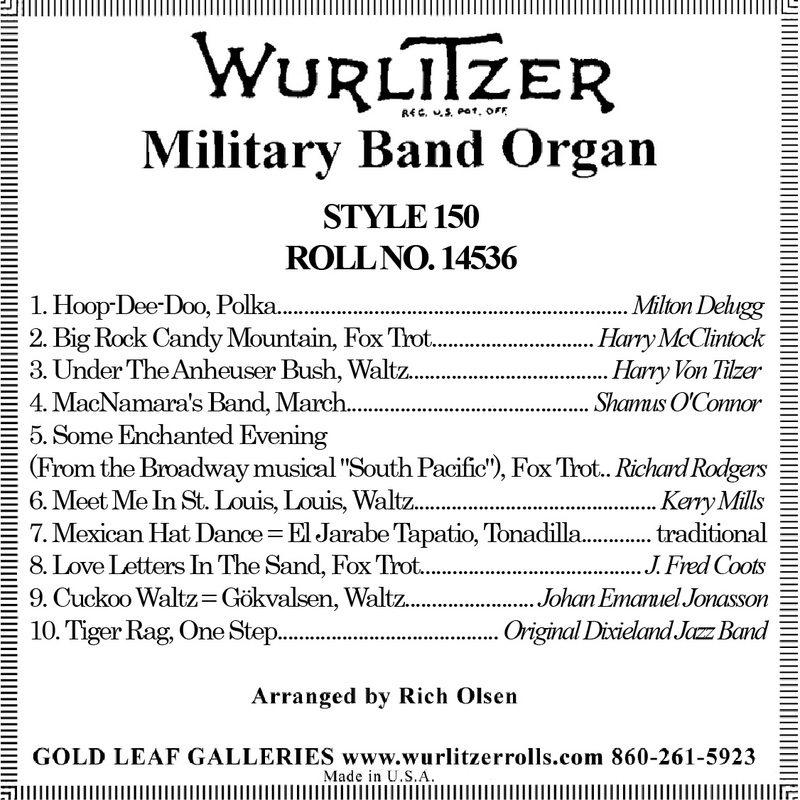 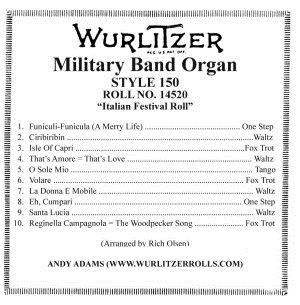 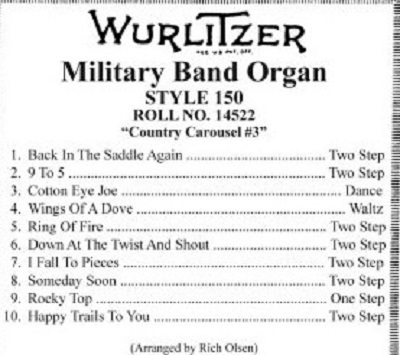 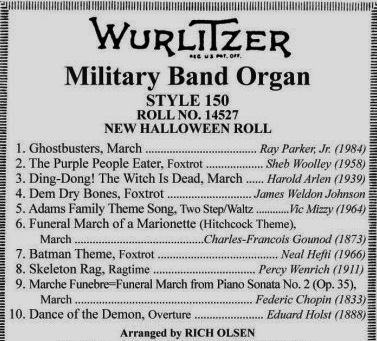 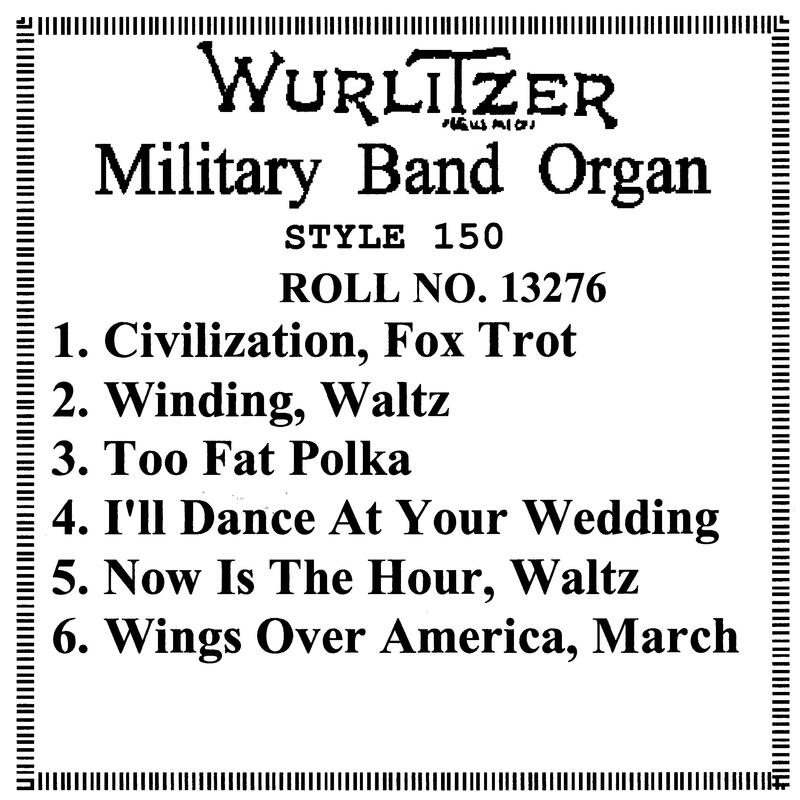 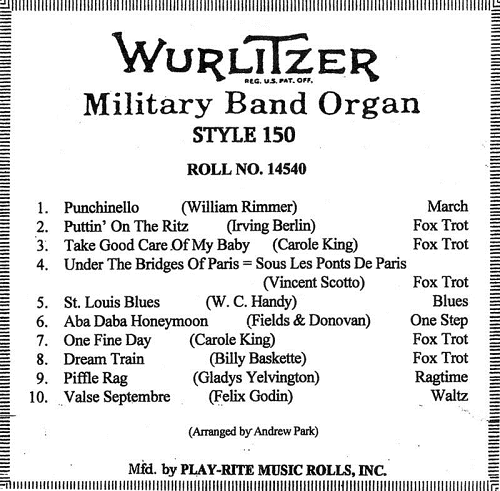 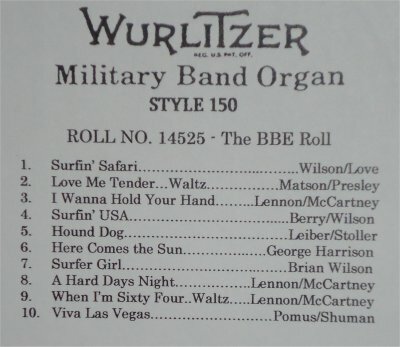 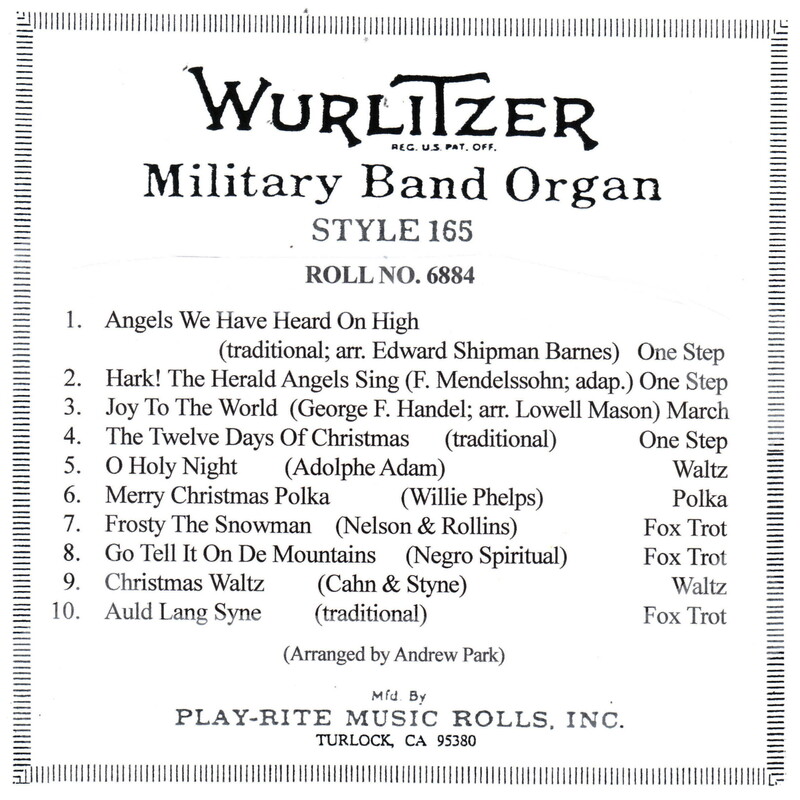 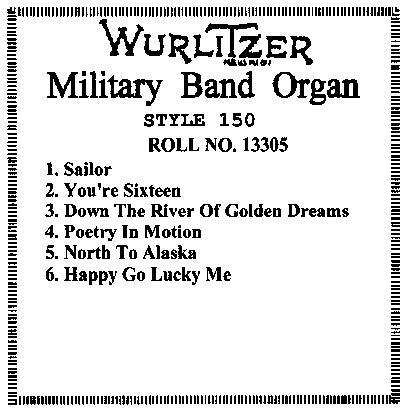 "FOX TROT, ONE STEP, WALTZ & MARCH"
"FOX TROT, TWO STEP & MARCH"
"Length Of Ten Piece Roll"
ROLL NUMBER 13036 "Patriotic Roll"
"Waltz MIDI FILE For Skating"
"Old Time Standard Songs In Waltz Tempo"
Dream Girl Of Pi K. A. 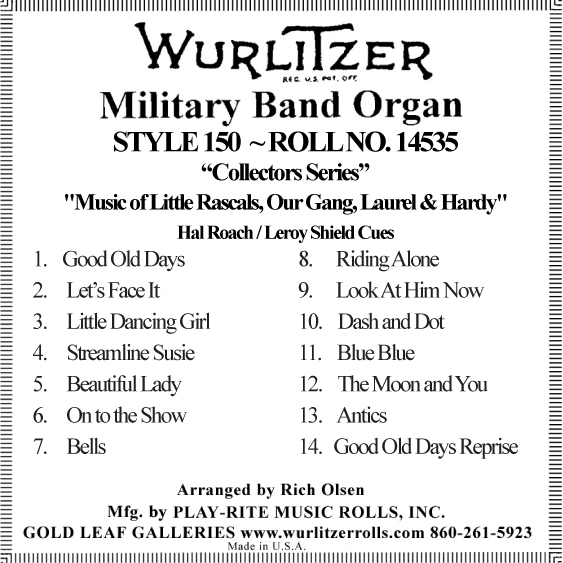 "Old Time Tunes, Volume 2"
"Old Time Tunes, Volume 3"
MEDLEY FROM WALT DISNEY'S "SNOW WHITE"
AMERICAN MEDLEY: "YELLOW ROSE OF TEXAS," "YOU ARE MY SUNSHINE," "RED RIVER VALLEY"
"Broadway Musical 'The Music Man"
ROLL WILL BE DROP SHIPPED BY PLAY-RITE MUSIC ROLLS INC.